SANTA CLARA — Running Back A plays for the 49ers. Running Back B plays for the 49ers, too. Running Back A is 5-foot-9, 205 lbs. Running Back B is 5-foot-9, 200 lbs. Running Back A runs a 4.41 40-yard dash. Running Back B runs a 4.39. Running Back A went to Georgia Southern from 2010 to 2013. Running Back B went to Georgia Southern, too, from 2013 to 2016. They overlapped for one season. Running Back A and Running Back B seem interchangeable, like clones. They will share playing time and split carries for the 49ers this season. Fans might struggle telling them apart. But in many ways, they’re total opposites. Their styles complement each other, and have since college. And the 49ers will use them differently. Thunder and lightning. Good read. Exactly, I had no idea. Great insight by Grant. This was a terrific piece Grant. Well done. Great insight. So who do you think wins out for the #3 spot? Williams or Mostert? Williams better light things during preseason. Mostert has the edge with ST. Thank you. I think the 49ers will keep both. We have a 5’8″ slot receiver in Taylor, why do we need a second one ? (Victor Bolden ) Also, every player on the team can kick the football…why do we need a 2nd punter…Jeff Locke ? Are those players just taking another players slot ? It isn’t a frat party…we need some Players…. Running Back C is 5-foot-11, 210 lbs. and runs a 4.41. Interestingly enough, compared to Running Back A, Jerick McKinnon by Lance Zierlein in his pre-draft analysis…. This one put a smile on my face Grant. When you are less the critic, and more the creative analytic, when it comes to writing about football (and likely other subjects as well) I can read your stuff all day. But do not sell McKinnon’s toughness short, or his physicality. He was forced to run the football plenty between the tackles playing QB at G.S. and McKinnon runs very hard through contact. No question he’s the more complete RB in this system, at least in my mind. It will be fun to watch! BTW, I’m pretty sure at this point that ShanaLynch are planning on keeping 4 half-back’s + the Juice, meaning 5 RB’s total (or as Grant would put it, Running Back’s A, B, C, D & E). I just don’t see any way Shanny is ready to give up on Williams now, unless he has a disastrous preseason, and my money is on Joe starring in this preseason. Mostert is just too good on special teams to let go. 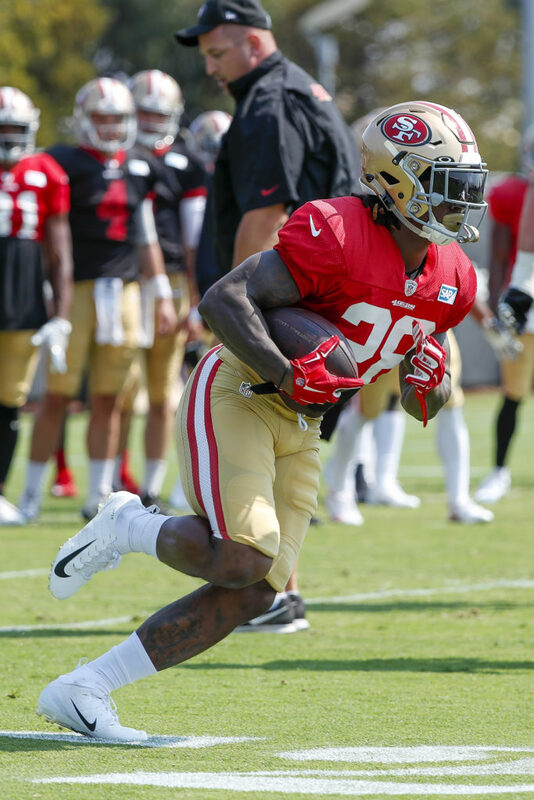 At what position group do the 49ers go into the season a little light, considering 5 RB’s is an above average number of RB’s on today’s NFL 53 man roster? If the backs are as different as Grant says, is there any concern that what back is in the game tips the what play the offense is running? Seems like they want to run Breida outside and McKinnon inside enough to keep the defense from reading the play. That’s the thing wilson. If the NFL figures out that you have a major tendency and rarely run McKinnon on the inside stuff, you’re tipping the defense, and making life easier than you want to be. That’s OK if you want to use use a 2-headed-monster RB approach, but boy, that’s a lot of money to pay a veteran RB to “split carries” with an undrafted, 2nd year player. Thanks, I think these backs and Kyle as a play caller are versatile enough to mix things up. Wouldn’t it be great for the defense to think McKinnon is going outside and run him inside for a gain or the opposite with Brieda. Even if its just a couple of times a game it keeps the offense dictating what they want to do. Sounds like our OL still needs some more work in run blocking before the season starts. When you say McKinnon rarely threw the ball at GS, was it often enough to develop that skill. And is there enough of a skill to work it into the playbook? I want to see some flea flickers. Use every weapon in the arsenal. I want Shanahan to perfect the offense he is most comfortable with and unleash it upon the rest of the league. Like the second half of the Super Bowl? Still have one eye in the mirror Sebbie? Hmmm, you seem to be obsessed with mirrors. I had to double check and make sure Grant wrote this. Waaay too complimentary of him. Must have chugged a few. But great article. I do like reading Grants stuff because, tho overly critical at times, he gives great insight to players, coaches, schemes etc. Yes, great insight, just like his dad, Lowell, who was always looking below the surface to comment on psychology and underlying motive, seeing deeply into the drama of a sporting event. BTW, I just joined this group and love the way you guys prod, probe, spear and trash Grant, mostly in good faith, pushing him to excellence as an analyst and writer. This is fun to watch, man, this real-time writer/audience interaction. This is a great group! And speaking of real-time, Grant, your periscope sessions are genius. Grant, time to change that high school year book photo of yourself. Really good read Grant, thanks! Now that’s football commentary. Good job. This complimentary skill set aspect is the hallmark of Shanahan’s blitzkreig. He would love to get Williams’ one cut into the game plan to further freeze LBs and safeties, but needs him to be more reliable, and he must pass block. Don’t miss Juice. He was underutilized last year, and as you pointed out, Breida can lead block. Now that was an uplifting, positive, informative piece. It’s nice to have some balance! Not sure that Mr Sebbie knows what a flea flicker is either, since he brings it up in reference to a halfback who was a college qb, but the actual QB, not the RB, is the thrower in the flea flicker. Van, maybe you did not see this, but I proposed a play where JG pitches the ball to McKinnon, who rolls out, drawing the defense towards him. Then, he passes back to JG who had rolled out towards the other side. McKinnon does not hand off or underhand laterals, but passes backwards to the other side of the field. Meanwhile, Goodwin starts off the play by ‘accidently ‘ falling down, so the DB will ignore him. Goodwin then gets up and flies downfield to accept a pass from JG. Mckinnon does make a pass, and since he used to be a QB, the chances for success is good. He also has the option to not throw the ball. He could keep it, and just run the sweep, if he feels like he has a good chance to turn the corner. Mckinnon would also have the option to pass downfield if he sees a wide open receiver. There would be a triple option threat, and McKinnon does have the option to pass the ball. There are also many other variations of the flea flicker, but the RB would need to make split second assessments and decisions. With his past QB experience, I fully believe Mckinnon could execute that strategy. Sherman out for a week. Sounds like his 30,000 mile wheels have hit 29,999. Hey Jack, don’t you think this could have been part of the plan for Sherman all along? Easing him back? Why would you want or need him to A) push his aging body through an entire training camp or, B) play anytime before the 3rd preseason game? You seem smart enough to see this coming Jack. Why do that when you could just give him vet days? Because each individual player is different. Been like that since the cows came home! Sherman is an aged veteran recovering from a serious ankle/heel injury. The kind of injury that jeopardizes careers. He’s also basically another DB’s Coach. Shutting down aged veterans for a week here or there in camp is an old time tradition bro. Why in the world does he need to be on the field this week … at all? Why not just let him work with the strength and conditioning Coach Wright and his assistants, along with DB Coach Hafley and his assistants, and help coach up the young guns? Either Sherman is ready for week one or he isn’t, and taking a week off right now is perfect timing. We have to worry more right now, about filling out the backend of the DB roster, so let the young men play this week. Sherman is starting this season, if he can get his body right. That we already know! Love original and creative humor. It is a sign of intelligence both in it’s creation and it’s appreciation. Seb is just jealous he didn’t think of it. Randy Moss now that’s one way to bring attention to the problem. Nicely done. Was he supposed to kneel through the speech? I wish he had mentioned Oscar Grant, who was lying down face first in handcuffs, and was shot in the back. If you insist, but I have to go to a birthday party today, so maybe tomorrow. I do want to talk 4th down strategies. I hope the Niners go for it on 4th and goal. Seb’s 6th birthday…congratulations! Hope the Marvel super hero theme goes well. Be nice to the guests, and don’t be mistaken for the pinata! How does one protest during a Catholic Church service? Everyone is already kneeling. Jerry Jones loves women beaters, but thinks protesting is un-American. K’Waun Williams went down with an apparent leg injury. He’s been replaced by fifth-round pick DJ Reed in the slot. Jimmie Ward remains on the sideline with a hamstring tweak. Need to get Sebber to debrief him so he can gleen intel on the Vikings. In the Jerick McKinnon situation, he played all year until the NFCC Game. He can provide some good intel. Gonzales was only on the Vikings for a cup of coffee, so his intel will be limited. Still, I am glad the Niners are obtaining players from playoff teams, and CG may give some insights into the locker room dynamics. I do not expect too much from the playbook, because the Vikings are changing things up for Cousins. That was informative. Good job. Most Steelers rookies are buried on the depth chart….. Each player picked is buried on the depth chart, with only third-round tackle Chukwuma Okorafor listed as a second stringer. One thing I worry about the RB situation is- while Grant talks about the similarities in size and speed, then discusses the inside and outside running abilities, the one thing lacking is having a RB who weighs more than 205 lbs. Carlos Hyde weighs 230 lbs, so he could take the beating better than a 205 lb player. Juice may be an option, but he has had a paucity of carries. Forcing a 200 lb player to run inside is just going to get him beat up. Niners need a one two punch, with a beefier back. I wonder if Jeremy McNichols can be that player, since he weighs 215 lbs. JM may also have good pass catching abilities, so he is going to make the 53 cutdowns difficult decisions. Maybe the Niners are expecting attrition, so there would be room for JM. Joe Williams may have had good runs in TC, but if he cannot secure the football, he may be the odd man out.